Conveniently situated in Central Pennsylvania, Carlisle House Bed and Breakfast is perfect for vacations and weekend getaways near Pittsburgh, Philadelphia, NYC, Washington DC, and Baltimore. Your next getaway awaits in Jessie’s Room, a relaxing haven featuring a queen-size bed and private bathroom with jetted shower. Rates for this room vary from $159 to $229, according to the season. If you prefer not to book online, please call us at 717-249-0350 or email us at Info@TheCarlisleHouse.com. This 2nd-floor middle room was the bedroom of Jessie Ewing from 1927 until she left the home in 1965. 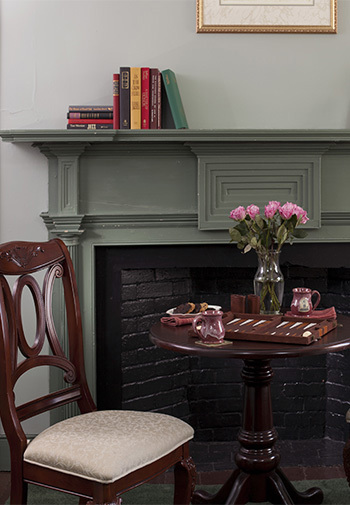 It features painted yellow pine flooring, original lighting fixtures and an ornamental fireplace. Jessie would have loved the beaded cameo queen bed and warm pale green colors and flowers of the room. It is said her presence has been felt in the room as she watches benignly over her home. 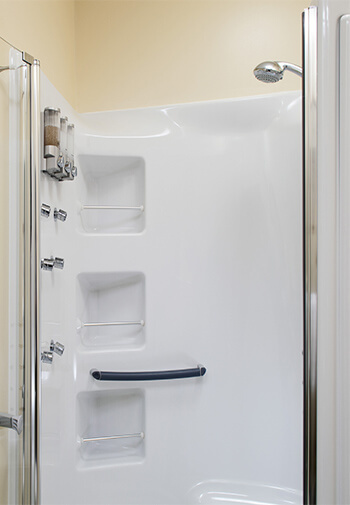 The adjoining bathroom features a very special shower with six front body jets for that all-over tingle! Also enjoy the spacious seat for a healing massage from ten powerful pulsating back-jets, and a thermostatic valve so you can pre-set your ideal water temperature.